Finally, the good fishing that we expect on Chesil in September, has kicked in. its just a shame that it has taken until almost October. Anyway enough of my complaining, I dont have time, as I don’t want to miss the great conditions that we have today. It looks perfect for Bass and Cod and its not too rough for Bream. I have had several reports of large numbers of Bream at Ferrybridge and Abbotsbury. 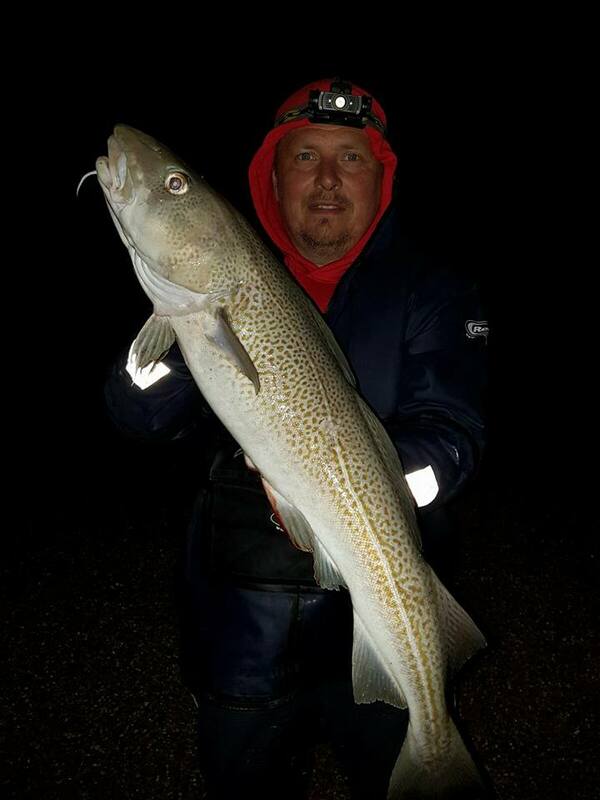 Scott Clarke had a couple of stunning looking Cod the other night. 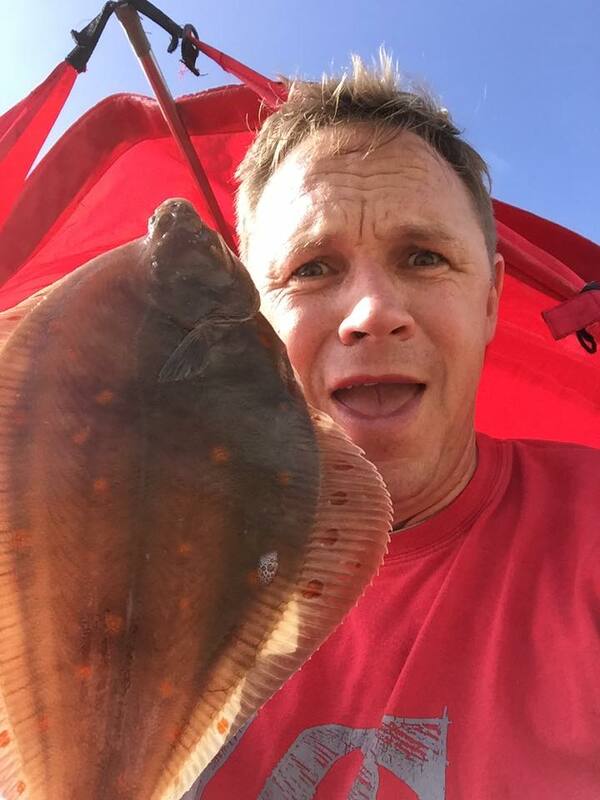 The flat fish are also around in good numbers, with the Sole fishing being the best I can remember for a long time. Chris also managed a few Sole from the same mark. 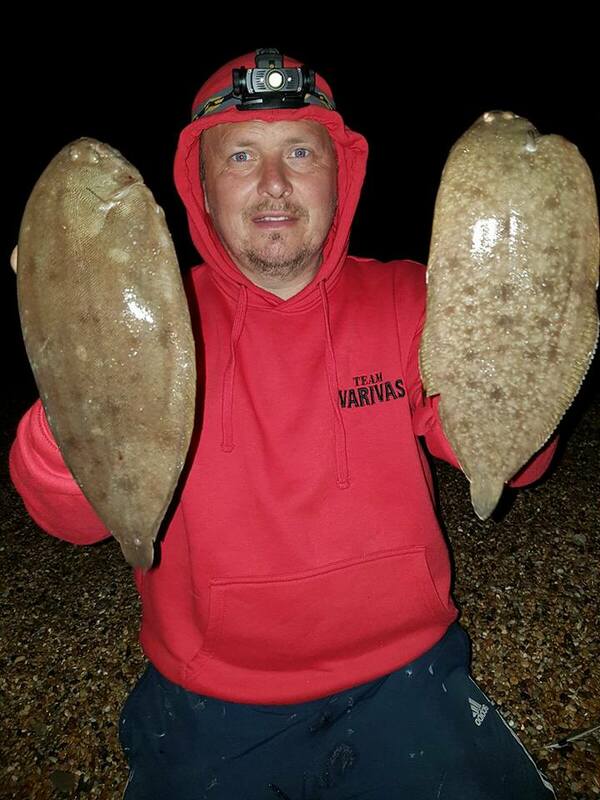 To prove how good the Plaice fishing is Jase Sheath fished a match at Abbotsbury in pretty tough conditions and was one of a number of anglers that have had a good few Plaice from all along Chesil this week. I am pretty sure they are feeding aggressively in preparation for heading to their winter spawning grounds. Chesil Beach: 2m waves with lightly coloured water. Chesil Beach forecast: Today is one of those days that could produce anything including Bass, Cod, Rays, Mackerel, Pollock, Plaice, Bream and Gurnard. If you have the chance then get down here. It will be very busy on the beach tomorrow, as the Cod chasers will be out in force. The downside is that it wont be easy fishing for the next couple of days. There is a strong wind blowing into your face and the surf run off goes back a fair way. You will need to be a reasonable caster to get out to the fish, or you just need to target Bass at close range. Don’t let your line go slack as the surf pounds it. otherwise you will lose all your gear as it gets trapped in the shingle. Conditions will be very similar tomorrow, then on Sunday the forecast is for almost no wind. That will make for really good conditions to hit those marks at range and pick up the flat fish. If you want some sport don’t forget to bring a float set up for some Garfish, as they love the conditions after a blow. Portland: I fished Portland Bill the other evening, in what can only be described as perfect Bass conditions. The water was clear and fizzy and with the wind at my back I was able to cast my lures a long distance. Unfortunately the Bass decided it wasnt for them. I didn’t have a single knock, not even from a Pollock as the light started to fade. However I did see a huge Wrasse cross a very shallow boulder field right under my feet. Wrasse fishing should be good this weekend, with the east side of the Island being a lot more comfortable to fish. They will take both soft plastic lures and bait such as Crab and Ragworm. Portland Harbour: The fishing in the harbour should improve with the larger tide. It is this time of year that we often see some nice Bass along the shallow shore line. Sandsfoot Castle is always one of my favourite marks to target them on lures. There are plenty of small Wrasse and decent Garfish around Ferrybridge. Weymouth Bay: I seen a very sad sight in Weymouth harbour this week. A fairly young guy was catching numerous Bass and killing them, even though a lot of them were undersized. He clearly knew that he was wrong on both counts, as when I pointed out to him that he was fishing illegally, he made a pathetic excuse up that the fish were all deep hooked and were going to die anyway. This in fact was certainly not the case on the one I seen him catch. I then heard him boast to his mate that he had sold an 8 and 5lb fish to the local chinese restaurant for £15. He did move on when I said I was going to report him, the problem is, where or who do we report these blatant acts too? I am still none the wiser after making a number of calls. If the rule can’t be enforced then remove it and make it a fair playing field for all. Rant over, and despite him taking a number of Bass, there are still plenty to be had in the harbour. The best bait is live Prawn, Sandeel or Ragworm. The Mullet are also feeding very aggressively and seem happy to take bread on the surface, or chase baited mepps. 3 Responses to "Early Cod and late Bream. Its all happening"
Sean, the MMO have responsibility for enforcement of the Bass fishing legislation. You need to report any illegal activity directly to them. Failing that, pass the info to the Southern IFCA (covering Dorset) who should be able to forward it on to the relevant people. Simple Solution is next time he’s seen on the Pier, behaving in the same manner! Chuck him and tackle over the side, But only do it with the tide OUT?